Founded in 1900 as Florida's first law school, Stetson University College of Law has educated outstanding lawyers, judges and other leaders for more than 100 years. In 1954, the College moved from Stetson's main campus in DeLand to Gulfport, nestled in one of the 25 largest metropolitan areas in the United States. The College of Law opened a satellite campus in downtown Tampa in 2004. Stetson is fully accredited by the American Bar Association and has been a member of the Association of American Law Schools since 1931. *Full-time tuition does not include summer classes. **Part-time tuition includes required on-campus summer session. A variety of financial aid options are available, including a range of scholarships and loans. Stetson awards multi-year scholarships to selected entering law students. All admitted students are considered for scholarships; no special application is needed. Scholarships are awarded based on academic excellence, a range of other personal accomplishments and experiences, and the ability to further the mission of the College of Law. Applicants who wish for their unique circumstances and backgrounds to be considered should include an addendum with their application. Visit Student Financial Planning for more information. The full-time regular faculty of 50 professors is supplemented by two visiting full-time professors and 50 adjunct professors in specialized areas. The three-story Dolly & Homer Hand Law Library in Gulfport is a central part of the Stetson Community, especially the students’ law school experience. As a center for student engagement, students can seek research and technology instruction, find quiet places to study, and engage in wellness activities. The Hand Law Library also houses the Academic Success and Bar Prep Services Department, as well as the IT Department. And in addition to 34 study rooms and 135 study carrels in the Hand Law Library, there are three classrooms where seminar and skills-based courses are held. Stetson University College of Law has more than 9,000 graduates, including judges, prominent attorneys, business leaders, government officials and academicians. Though 76% live in Florida, Stetson graduates practice in 48 states, the District of Columbia, U.S.V.I. and Puerto Rico, and 55 foreign countries. Stetson provides career coaching and instructional programs for students and alumni. For the class of 2017, of 263 graduates, 245 were employed and 6 were enrolled as full-time students on March 15, 2018. Visit Employment Reports for more information. Stetson had a 56.0% bar passage rate on the February 2018 administration of the Florida Bar Examination. Stetson graduates had a 67.2% bar passage rate on the July 2018 administration of the Florida Bar Examination. Summer Law and Policy Externship in Washington, D.C.
Dual degree and joint degree options: J.D./LL.M. in Advocacy; J.D./M.B.A. 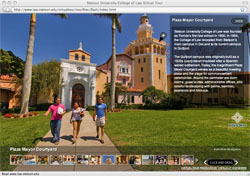 Explore the sights and sounds of Stetson University College of Law's Gulfport and Tampa campuses.